Lucky Ace Poker are one of the newer kids on the newer kids on the online poker block, but they’re already making a name for themselves. Their software platform is the same as that of 888poker and was developed by Cassava enterprises. The software is one of the best offerings in online poker with lots of novel features and a smooth and user friendly interface. Lucky Ace are licensed in Gibraltar and owned by the holding company Kamay Holdings ltd. The company headquarters is in Limassol in Cyprus. As well as using Cassava’s software which powers 888poker, they’re also on the same network as 888’s players meaning that those who play at Lucky Ace have access to a huge player pool filled with customers from 888’s casino and sports betting site. In fact the player pool is the 4th largest in the online poker world with up to 4,000 cash game players online at a time. The software at Lucky Ace Poker is among the best in internet poker. They are constantly making upgrades and are pioneering some exciting new technology like webcam tables, where you can see the other players at your table through the use of webcams. They also have all of the features that are important to serious poker players, like re-sizable tables, tiling and cascading of tables, synchronised tournament breaks. All of this is supported by a lobby that’s easy to navigate with plenty of filters to ensure that you only see the games that interest you, and nice game-play graphics with smooth animations, sharp contrast and 4-colour decks to make multi-tabling easier. 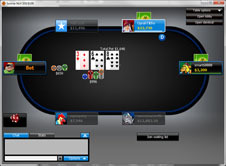 Lucky Ace Poker isn’t available for Mac and Linux users. Several online reviews will tell you that Lucky Ace has an instant play option which will allow Mac and Linux customers to play using their internet browsers, but this isn’t true. Unfortunately, playing at Lucky Ace poker is restricted to Windows users. You may find a solution to your problem in the flash poker sites and Ubunti poker sites guides. One of the best things about Lucky Ace Poker is the bonuses and promotions they offer, and this is why they’ve been so successful at attracting new players. Players signing up to Lucky Ace are entitled to a 100% first deposit bonus up to $400. Of course you have to play a bit of poker at the site to receive your bonus. Every time you accumulate 100 Bonus Points through real money play, they’ll deposit $10 into your account. You’re given 2 points for each dollar you pay in tournament fees or cash game rake. As well as that, new players will be given a ticket to the $100,000 First Depositors Challenge, where new players can win a free seat in the Sunday $100,000 Guaranteed prize pool tournament. You’ll also get tickets to $3,500 worth of freerolls. The VIP club at Lucky Ace gives you the option to turn your Bonus Points into real cash rewards. As you play for real money, you climb the statuses from Blue to Platinum and if you play enough you can achieve the yearly VIP Diamond Status which entitles you 36% cash back. Other ongoing promotions include Rewards Freerolls, a $25,000 bonus for hitting a Royal Flush, and Rewards Tournaments which give you the opportunity to climb through the VIP levels for free! Lucky Ace also have a lot of promotions throughout the year that give you the chance to qualify for live tournaments like the World Series of Poker for next to nothing. Lucky Ace accepts a huge range of deposit methods, starting with the very common ones like credit and debit cards, PayPal, Neteller and Moneybookers (Skrill), and continuing down to the likes of individual countries’ bank debits such as iDeal in the Netherlands, Bancontact in Belgium, and POLi in Australia and New Zealand, as well as pre-paid cards like PaySafe, Ukash, and PayPoint Vouchers. If you’re lucky enough to win some money to withdraw, you can do so by Bank Transfer, Skrill, Neteller, Paypal, UK Credit Card, and some debit cards. These methods have a minimum withdrawal amount of $6 with the exception of bank transfer where the minimum is $20. The maximum you can withdraw per month is $30,000. Lucky Ace offers all of the poker online poker variants. Most of the games are centred around No Limit Holdem, but they also host Omaha, Omaha hi/lo and Stud games. As Lucky Ace share their tables with 888poker, the games are always busy and you’ll get up to 4,000 cash game players in the evening time CET, as well as multi-table tournaments running around the clock. Furthermore, because 888’s players often come from the casino and the sports betting sites, the standard of play for Lucky Ace players is extremely low, meaning you’ll find it extremely easy to win there. The tournaments are particularly soft and the $100,000 Guarantee tournament that takes place on a Sunday evening is full of bad players that have won their way in via satellite tournaments and it represents one of the best value big prizepool tournaments on the internet. Lucky Ace are a trustworthy brand and an up and coming name in online poker. The fact that they have access to a huge player pool and state of the art software makes them a great choice of room to play your poker at. They look after their players well as evidenced by the ongoing promotions and VIP scheme which they run. We would have no reservations about recommending Lucky Ace to our visitors. Best alternative to 888 Poker. 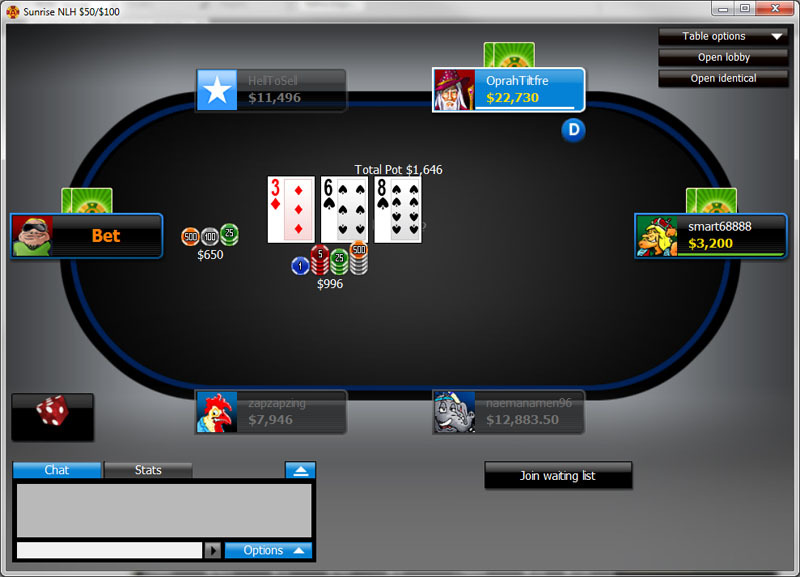 $100k GTD tournamnet on Sundays. Untapped waters for fishy players. Easy banking options for deposits and withdrawals.